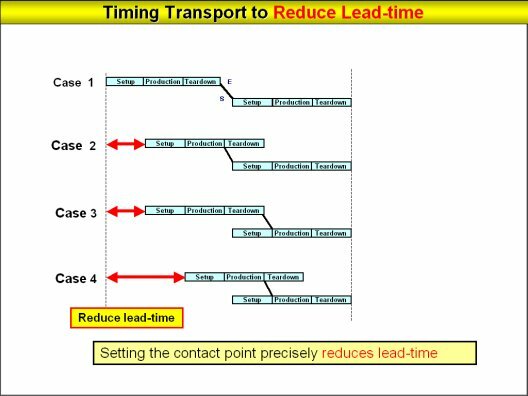 Q: Manufacturing and transport were done in smaller lot sizes with theory of constraints scheduling, but does it have a method for reducing lead-time? A: The method for reducing lead-time shown below, that is, transport timing. Take the example of the stacking method ES shown in the diagram below where the work in the subsequent process starts after the previous process's work is complete. However, depending on what is being manufactured, products from the first process may not be brought to subsequent steps even if they are complete and work in progress will be brought to the subsequent process (case 2). That will reduce lead-time 10-20 percent. In case 3, the pre-arrangements are made for the subsequent progress and manufacturing starts when the work in progress arrives. That gives a reduction in lead-time of 10-20 percent. With case 4, the reduction in lead-time is even greater, from 20-30 percent. This method is particularly effective when pre-arrangements and post-arrangement time is long. That concludes the description of methods for Reducing production lead-time through the use of the Advanced Planning and Scheduling System. The Advanced Planning and Scheduling System does all the calculations for these steps very quickly.